Japan Tobacco has filed a lawsuit to block a plan by the Thai government to require graphic warnings on cigarette packages to cover 85% of the package space, leaving only 15% left for the brand name. The Japanese company said the measure violates Thailand's constitutional provisions guaranteeing freedom of expression. The Thai Tobacco Trade Association, a group of 1,400 retailers, wholesalers and distributors, and cigarette company Philip Morris Thailand are also planning to file similar lawsuits. If the plan goes into effect, Thailand will have the world's largest graphic warnings on cigarette packs. Pornthep Siriwanarangsun, director-general of the Thai Disease Control Department, said she was ready to fight the lawsuit. "It is for the protection of people's health. We aren't concerned about the lawsuits." Japan Tobacco has filed a lawsuit to block a plan by the Thai government to require graphic warnings on cigarette packages to cover 85% of the package space, leaving only 15% left for the brand name. The Japanese company said the measure violates Thailand's constitutional provisions guaranteeing freedom of expression. The Thai Tobacco Trade Association, a group of 1,400 retailers, wholesalers and distributors, and cigarette company Philip Morris Thailand are also planning to file similar lawsuits. 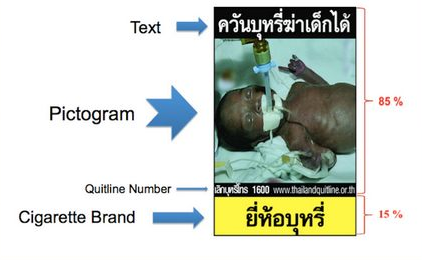 If the plan goes into effect, Thailand will have the world's largest graphic warnings on cigarette packs. Pornthep Siriwanarangsun, director-general of the Thai Disease Control Department, said he was ready to fight the lawsuit. It is for the protection of people's health. We aren't concerned about the lawsuits.